Why does my car squeal? When the engine is cold and the car is parked, open the bonnet and then start the engine. The fan belt is often located on the left side of the engine and you should be able to see it moving when the engine is running. Listen for noise coming from this area, particularly when the belt is under extra load. Put the alternator under load e.g. turn on full beam headlights, heated rear windscreen etc. 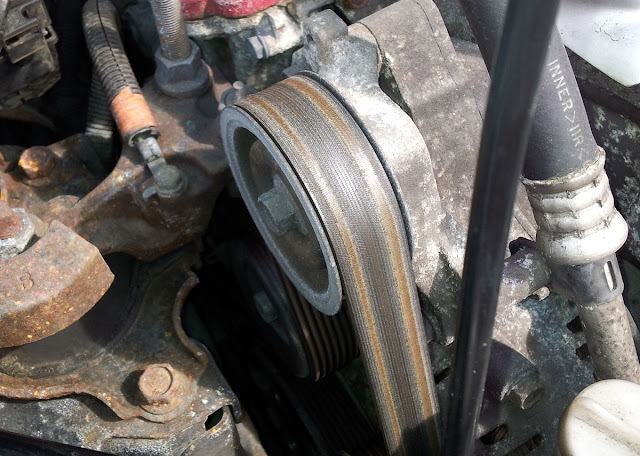 Cars most often squeal after the car has been left overnight, particularly if it is damp - this is because the alternator is putting extra load on the belt as it's trying to re-charge the battery and also dampness can reduce grip, causing the belt to slip. If you can hear the squealing noise when the car is stationary, then the problem is probably your fan belt (also known as alternator belt, aux belt or accessory belt) and you should check out our guide on how to fix it. If you cannot hear the squeal noise when the car is parked with the engine running then it is quite likely that the noise is related to your brakes. Go for a drive with the windows down and determine if it happens when you are driving or only under braking. Unless you have a seized brake caliper then any squealing is only going to occur when you apply the brakes to slow down. If you car squeals when you apply the brakes then I would strongly recommend taking it to a professional.